Tilt/slide patio window handle Hoppe New York series on rectangular rose. 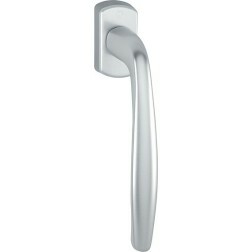 The New York window handle series by Hoppe is a best seller in our online catalog. Alluminium composition and modern design. Hoppe guarantees the functionality of this product for 10 years. So it is safe and guaranteed. IMPORTANT: This version has a longer handgrip with respect to a classical window handle (16.8 cm).